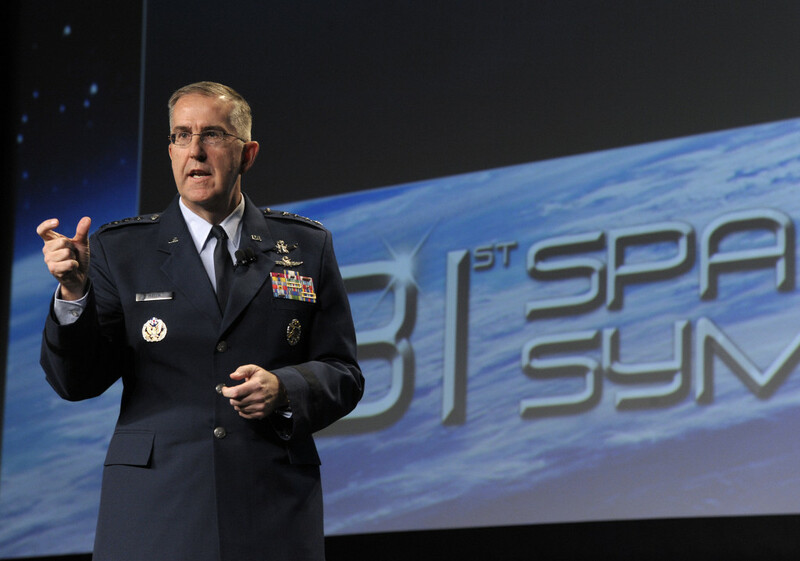 April 21, 2015 – General John E. Hyten, commander of Air Force Space Command, recently identified several key actions to be taken to ensure U.S. strength in space for the future. On April 14 at the 2015 Space Symposium in Colorado Springs, Colorado, he discussed his command priorities, changes in store for space crews, and new initiatives to assure access to space. General Hyten explained ways in which the space operator crew force is going to be changed. He plans to normalize the space force presentation to U.S. Strategic Command and ensure that U.S. Strategic Command gets space force capabilities that they require. “The way you present forces has to be structured so that when you actually ask for capability, you get that capability,” he said. He also will change the space operator construct. From young Airmen to senior NCOs to officers, crews will work a six-months-on, six-months-off cycle. On the alternating six months, the crews will be in advanced training to ensure experienced operators capable of operating in a contested or degraded space environment are on crew at all times. The General also discussed lengthening of initial training to add more depth to the curriculum, which will better prepare crews to operate in contested or degraded environments. “We’re going to do business fundamentally differently because our Airmen need to be prepared for tomorrow’s fight,” he said. General Hyten then talked about three challenges to assured access to space. He said, to the audience of military and industry leaders, that they all have the same goals: assured access to space, maintaining competition in launch, and moving away from the Russian RD-180 engine. To assure access to space, his primary concern is how to maintain two launch providers in the aftermath of a launch accident. “God forbid, someday we will have an accident again. It’s not going to be the next launch; it’s not going to be the launch after that, but it will happen again – it’s the nature of the business,” he said. He pointed out that, based on past launch accident history, the launch provider would be unable to launch for a lengthy period of time due to the accident investigation and loss of confidence. An automated flight safety system will use GPS tracking for launches, reducing maintenance and sustainment costs for aging telemetry and tracking systems. In addition, an automated flight safety system will make the ranges more responsive to industry and government launch requirements. The last challenge he discussed is the ground architecture for operating space systems. He said that there are too many stand-alone ground systems, with many satellite constellations having their own unique ground system to operate each constellation. He highlighted the challenge to accomplishing these actions with sequestration still looming and warned that if sequestration occurs in 2016, Air Force Space Command would be forced to cut launches, decimate weapons systems sustainment, and delay programs like the Space Based Infrared System mobile ground systems, which contribute to the U.S. nuclear command and control architecture. General Hyten closed his remarks by emphasizing the importance of taking care of Airmen and families, underscoring the point by explaining the impact of deployments.